On the last episode, the top 12 finalists were revealed. Did you watch the last episode? If you missed it, we have a full and detailed recap right here for you. On tonight’s episode as per the FOX synopsis “the competition gets even fiercer when the Top 12 perform LIVE in a special, two-hour event.” Also on tonight’s episode Empire stars Jussie Smollett & Bryshere Gray will be performing. 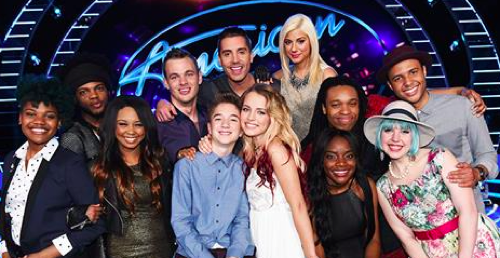 Tonight’s episode of American Idol kicks off with the Final 12 contestants walking the red carpet, preparing for their live performances in Hollywood. American Idol host Ryan Seacrest takes the stage and introduces the judges: Jennifer Lopez, Harry Connick Jr, and Keith Urban. Empire’s Taraji P Henson joins Ryan on stage for a surprise appearance, and delivers the live vote results from America. One by one Ryan will call up each singer that is safe tonight to sing. The last contestant to not have their name called tonight will be eliminated. Sarina-Joi Crowe takes the American Idol stage and performs “Neon Lights” by demi Lovato. It’s up to the American Idol judges to decide whether or not they will use their “save” on her. They only get one save per season – if they don’t use it on Sarina then she will be eliminated and go home. After Sarina sings the judges deliberate, Jennifer Lopez announces that they will not be using their save this week on Sarina – she is officially eliminated and going home.